BRAND NEW FOR 2017 - Gray Nicolls present the Velocity XP1 Cricket Bat Range in a time where power is key, The Velocity XP1 provides it to you in abundance. Beautifully crafted and balanced, but never sacrificing the perfect pick up and visually intimidating to provide any player confidence to take on the challenge. 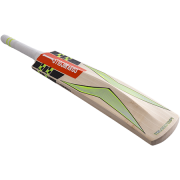 The Velocity XP1 Cricket bat is sculpted with a mid blade hitting zone, suited to the front foot player as well as those that like to play off the back foot and concave sculpting to give professional pick up and balance. The Velocity XP1 Cricket Bat has recently been used by England and Yorkshire wicket-keeper Jonny Bairstow in the England 2017 autumn tours of Bangladesh and India. Backed up with our fantastic customer service at All Rounder Cricket Equipment Store.